If you are a parent, educator, professional, business owner......a human being the Nurtured Heart Approach™ (NHA) has something for you! Unlike many approaches designed to improve communication, manage behavior, or teach social skills to a certain age group or profession, the NHA crosses from children to adults, homes to schools, and daily living to the business world. Surprised? 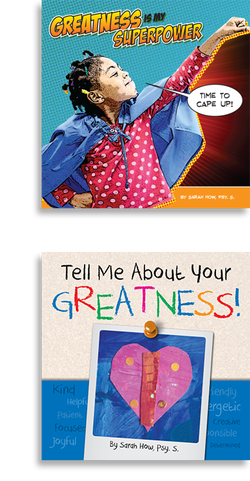 What if every person could choose to cape up and be a superhero of greatness? Each day students, teachers, and school staff are faced with tough character choices and decisions on how to act and how to treat others. is a book for children, parents and educators to look at the school day differently and capture the ordinary moments and magnify them to reflect the extraordinary character qualities that are happening daily.